This week, a fifth grader from Monticello-Brown Summit Elementary, Nevaeh White, had a life-changing experience. She saw a story she had written, “The Showdown,” turned into a real, live, fully-staged opera at the Carolina Theatre. And not only that, but 6,000 other fifth-graders experienced the magic of opera through both “The Showdown” and the 19th-century “Hansel and Gretel,” performed by UNCG students. 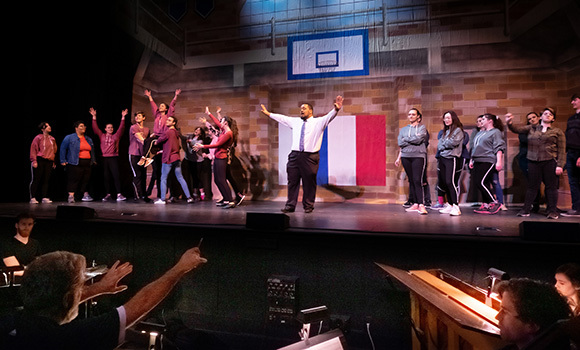 It was all part of the Opera at the Carolina program, a 25-year collaboration between the UNCG Opera Theatre, Greensboro Opera, and Guilford County Schools. “How many of you think opera is boring?” asked UNCG Director of Opera and Greensboro Opera General and Artistic Director David Holley at the opening performance. A few hands flew into the air. “Well, we’re going to change your mind,” he said, with complete confidence. And his words rang true. Even the skeptical who had raised their hands soon found themselves tuned into the performance, from the first note to the last. “That’s pretty good,” said Nevaeh when she saw the dance routine she herself choreographed for “The Showdown,” with the help of Holley and School of Dance faculty member Michael Job. Nevaeh White choreographing a dance for “The Showdown” with UNCG Opera Theatre performers. Nevaeh’s story came from a pool of 60 submitted by rising fifth-graders from across the county for the “Barbara Ann Peters Write Your Own Opera” contest that Peters and Holley initiated in 2010. In some years there have been as many as 150 entries; competition is tight for the next 10-minute original opera. 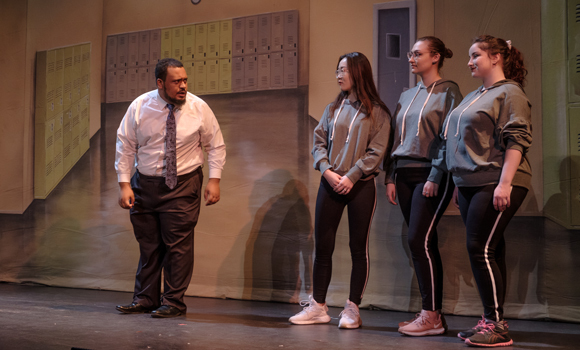 “When I read ‘The Showdown,’ I thought: I have our story – it’s obvious,” said Holley, who wrote the libretto and enlisted fellow School of Music faculty member Alejandro Rutty to compose the music for the production. “The Showdown” is a story about bullying and forgiveness. Students who have recently transferred to Richland High School from Mockery High School torment their new classmates who have tried to welcome them. When they blame the trouble on the victims, their teacher Mr. Ricardo calls for a one-on-one dance-off between the two crowd leaders. The Mockery student falls and hurts her leg, but instead of digging into her, the Richland leader decides to help her. “United we stand, divided we fall,” she sings, and the two crowds come together as one. Holley worked with Nevaeh’s story so that it emphasizes peace-making and unity. While the ending was just a bit different from what the author had penned from the start, she liked the changes. “It’s awesome,” she said, after seeing the first full run-through. “My friends will go crazy, and they will love it. And I also love it because I like to help others think about what they should do when problems come up,” said the fifth-grader, wise beyond her years. 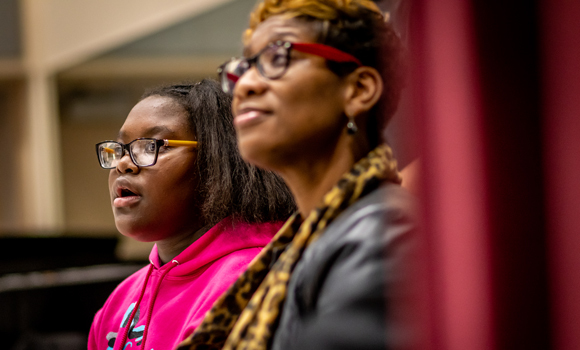 (l-r) Nevaeh White and her mother, Shameka White, watching “The Showdown” rehearsal. 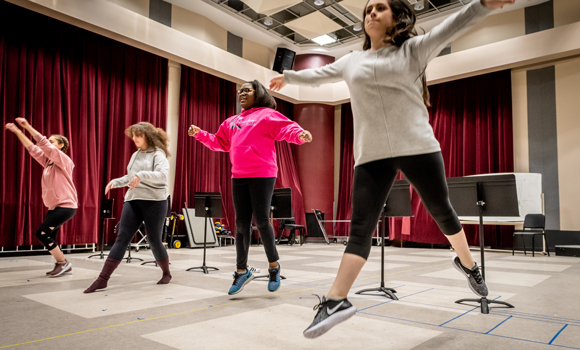 The UNCG students don’t just value the opportunity to perform, but the chance to make opera more accessible and to make a difference in children’s lives. 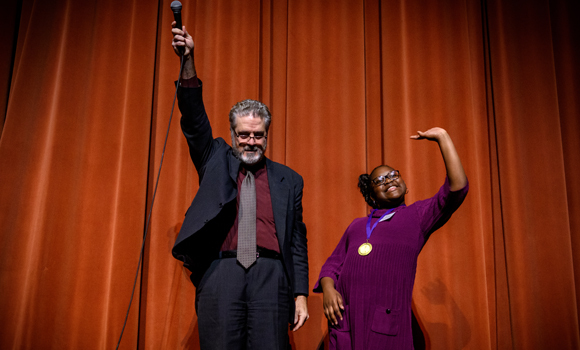 UNCG Director of Opera David Holley and this year’s winner of the Write Your Own Opera Contest, Nevaeh White.